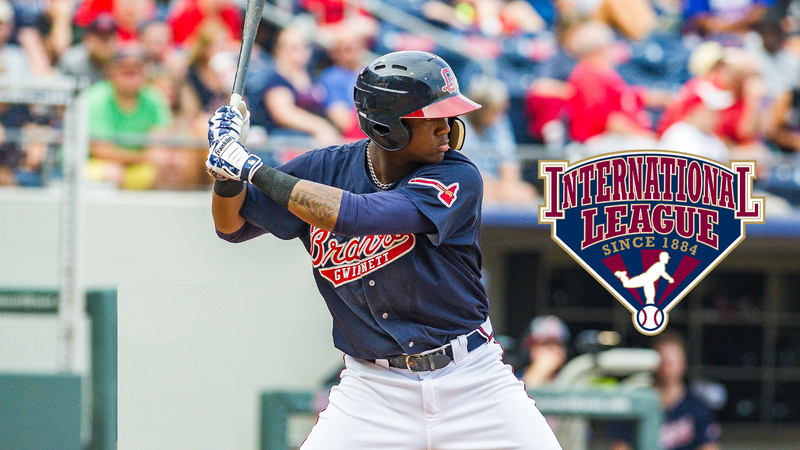 LAWRENCEVILLE, GA - The International League has named Gwinnett Braves' outfielder Ronald Acuna as its Batter of the Week for August 14-20. Currently the youngest player in the IL at 19-years-old, Acuna, batted .481 (13-for-27) with two doubles, three home runs, five runs scored, and eight RBIs in six games during the week as the G-Braves compiled a 4-2 record on the road. He led all IL batters in hits (1st, 13), total bases (1st, 24), and homers (T-1st) in that span. Acuna hit safely in each of Gwinnett's six games on the road, starting with a 3-for-6 effort on Tuesday in a 9-4 win at Scranton/Wilkes-Barre that also marked the first of three straight games with a home run. The next night, Acuna was 2-for-4 with a home run and a double while driving in all four of the G-Braves' runs in a 4-1 win over the RailRiders. On Sunday, Acuna added three more hits in a 7-1 Gwinnett win at Buffalo. Acuna is the 14th player in Gwinnett Braves history to win the IL Batter of the Week award and the first since Lane Adams won it for April 10-16, 2017. It is the third career weekly league award for Acuna, as he was named the Double-A Southern League Player of the Week twice earlier this season on May 14 and May 28. A native of La Guaira, Venezuela, Acuna is batting .355 (54-for-152) with 12 doubles, two triples, eight home runs, 28 runs scored, 23 RBIs, four stolen bases and a .618 slugging percentage in 37 games for the G-Braves since being promoted for his Triple-A debut on July 13. Since his promotion, he is leading the IL in hits, runs, extra-base hits (22), total bases (94), slugging, and OPS (1.035). Acuna and the G-Braves are back home at Coolray Field on Friday, August 25 for a doubleheader to begin a four-game series against the Charlotte Knights. For tickets, call 678-277-0340 or visit GwinnettBraves.com/tickets.